Cecilia Fox | Weekly Record Herald The Bethel school district will be starting a search for a new superintendent after Superintendent Ginny Potter announced that she will resign in July. The board is considering hiring a consultant to assist in the search and heard a presentation from Deb Campbell of K-12 Business Consulting on Tuesday. BETHEL TWP. 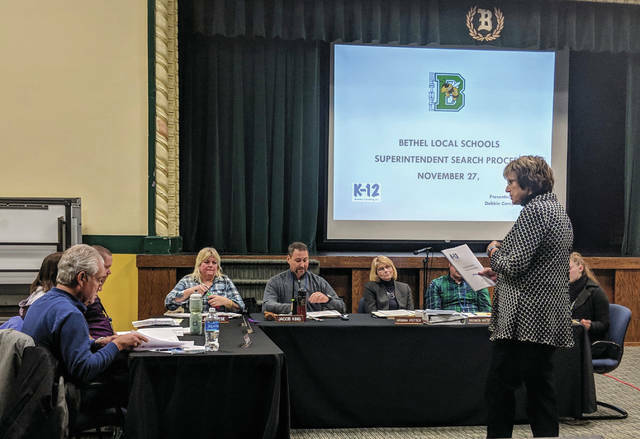 — Bethel Local Schools will be starting the search for a new superintendent this year. During their work session on Nov. 27, the board met with a representative from K-12 Business Consulting to discuss the superintendent search. The district worked with the company to hire its treasurer Brennon Hattery this summer and is considering hiring them again to assist in finding a new superintendent. Superintendent Ginny Potter submitted a letter of resignation in October stating that she will leave the district when her contract expires in July 2019. “Our goal is to make your job easy,” Campbell told the board. Campbell said the company assigns two full-time consultants to each search and would start recruiting immediately after being hired. She added that the goal would be to find a candidate who would work with Potter for several months before taking over in the summer. The board also discussed looking at companies to work with the district on a new strategic plan and discussed the need for more space in the elementary and options to provide that space. Potter estimated that the district will need to add six to eight new classrooms in the next four years to keep up with student population growth. The district is considering modular units, renovation of existing of spaces, or the construction of a steel building until a more permanent solution can be identified. The student population has grown from 946 in 2012 to about 1,500 this year. The board’s next regular meeting will be held at 7 p.m. on Dec. 10.
https://www.weeklyrecordherald.com/wp-content/uploads/sites/51/2018/12/web1_IMG_20181127_170744.jpgCecilia Fox | Weekly Record Herald The Bethel school district will be starting a search for a new superintendent after Superintendent Ginny Potter announced that she will resign in July. The board is considering hiring a consultant to assist in the search and heard a presentation from Deb Campbell of K-12 Business Consulting on Tuesday.